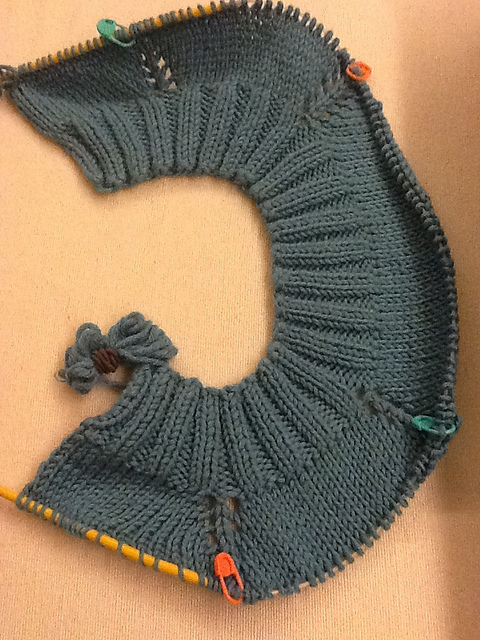 I've been sewing away like crazy recently, but I also have a knitting project in the works at the same time. While sewing must be done at home with the machine and iron plugged in and at the ready, knitting is more portable... I can work on my knitting while stuck in Jakarta's notorious traffic. I'm working on this top right now - the pattern caught my eye in an email from Patons yarn, Martha bought me the necessary yarn, and Liz and Meghan dragged it across the globe for me. 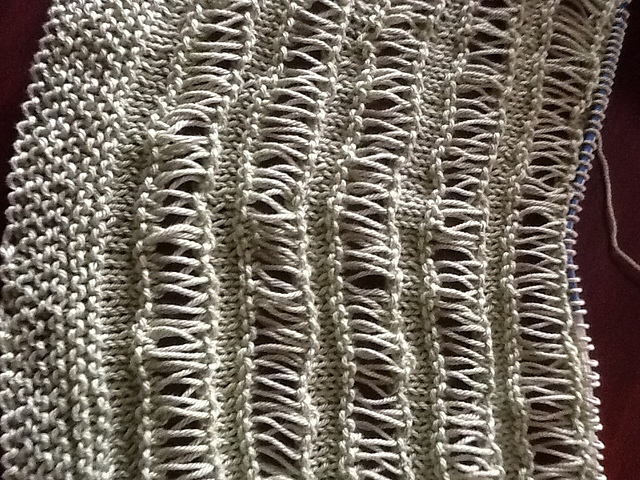 The pattern uses a technique called "drop stitch." Drop stitch is basically what happens when you screw up when knitting- you accidentally let a loop slip off the needle and it leaves a big loose hole in your fabric. 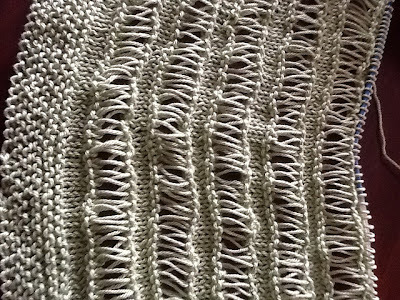 This pattern incorporates dropped stitches and turns them into cool looking, hole-y stripes interspersed with stripes of regular stockinette stitch. Pretty cool! Up close and personal with my purposefully dropped stitches. I'm making progress, dropping stitches like they're hot... it goes pretty quickly because you're not actually knitting those 1-inch stripes where you drop the stitches. I'm about halfway done. It's pretty different from stuff I've knitted so far, so I'm curious to see the final project. It could be cool or it could be a major fail. We'll see!! I printed up this free pattern from Prudent Baby and made it using the scraps from the Sorbetto tank top I made a few months ago. While it came out pretty cute, I'm pretty sure I must have printed the pattern too small, because it came out tiiiiiiiny. Maybe it might fit a newborn, but I have serious doubts about its ability to fit its intended wearer, Ms. Zoe. Sigh. In any case, it allowed me to try out some new techniques, some of which I handled with some level of success, others not so much. Hand sewing a buttonhole: not too bad! Sewing really small curved areas: pitiful. Live and learn. Anybody know a newborn girl looking for a hand made summer top? I promised you more Scout t-shirts... here's the next installment. This one is made from some batik I bought in Jogjakarta last month. Came out pretty cute! This pattern is definitely worth downloading and is perfect for a newbie sewer such as myself. I went down a size from my wearable muslin because the pattern is cut roomy. I also think I set the sleeves in a little better this time. I guess that's why people make muslins... practice makes perfect (or at least better). Who's combating a bout of homesickness with some serious crafting? I've had my eye on this pattern at Grainline Studios for a while now: the Scout woven tee. 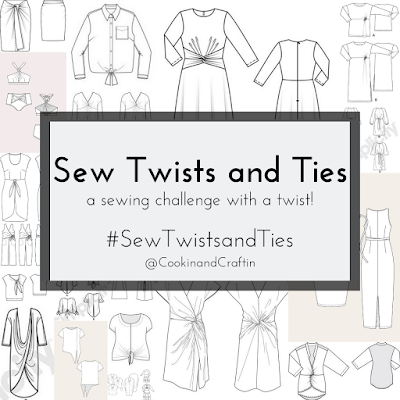 It's so simple, so easy to make, and infinitely wearable. You could dress it up or down, and although I imagine this tropical version I've made is more of a dress-down version, I am picturing a version in batik or ikat that could be worn for work with a cardigan or under a suit. All of the various versions I saw online looked great... lace, flowers, polka dots, solid... expect more of these from me! This top was originally intended to be muslin for me to try out a new pattern, but now I think I kinda dig it for its vintage vibe. I used some more fabric Martha hand-me-downed, left over from her '80s era Hawaiian phase (?). I also employed some of the circa 1978 bias tape for the neckline... smells a little funny, but got the job done! I frenched all my seams, per this tutorial, and made slightly poofy sleeves by cutting the sleeves out one size larger than the body. I think after making several garments over the last few months that I'm finally getting the hang of this sewing business. I was trying to use up the mint leftover from my mint ice cream as well as some feta left from my grilled corn and feta salad... add in a zucchini and you get: mush. Oops. Very loosely (no ricotta, fresh rather than dried mint) based on this recipe from an Australian cooking show I've been watching recently, I put together these zucchini, feta and mint fritters that I planned to top with a spicy fresh tomato sauce. Unfortunately, despite my best efforts to drain the zucchini of its water, these fritters were super soggy, floppy and definitely not crisp like I imagined. Sigh. But the flavor was good... perhaps a similar flavor combination in a different format next time. Over pasta? Did you know that tempeh originated in Indonesia? On the island of Java, in particular. Me neither, until recently. Fermented soy beans formed into a cake and wrapped in a banana leaf, it's got a meaty texture and it's pretty inexpensive and quite tasty. It's got a bit of a nutty flavor that I adore. In the U.S. tempeh is almost exclusively sold to hippies, but here's it's ubiquitous. I've been eating a lot of it (spelled "tempe" here) around town... fried, curried, coated in sweet soy sauce and chilis... they've got it all. My favorite, though, is this curried tempe/tofu combo (which I think may be called tempe gulai, but I am not sure yet- I just point) that I have been getting for lunch, along with these awesome papaya leaves and spicy green beans (all the above, including Diet Coke for the equivalent of $2.92). Inspired, I bought some tempeh at the grocery store and used it to make a recipe I had made last year using tofu... orangey ginger glaze, cilantro and coriander, plus my addition of hot sauce and green onions. Mmm. I highly recommend you try some tempeh, and this recipe. I also warn you that the tempeh smells not unlike feet when it first starts to cook. Don't be intimidated or dissuaded. Soldier on and it will be worth it. Thai iced tea is probably one of my favorite drinks... there's just something about the creaminess and aroma of it that complements spicy Thai food so well. The internets tell me that the special taste comes from strong brewed black tea combined with a varying combination of cardamom, orange blossom water, star anise and tamarind. Plus it's got that crazy orange color. Tim found some loose Thai tea at our grocery store here in Jakarta, so we bought a big old bag of it. For some reason, the idea of an ice cream based on Thai iced tea popped into my head. I figured someone out there had already made this delicacy, and lo, they had... I followed this recipe from Use Real Butter, which in turned followed ice cream king David Lebovitz's basic ice cream base recipe. In a nutshell, you steep the tea in the milk until it turns that distinctive orange color, strain out the tea and then proceed to make a pretty basic custard that you freeze in your ice cream machine.... in the end you have this tasty, bright, fragrant dessert, perfect for a hot day. I made this top this weekend and already wore it out for beers- quite comfy. I made it using Burdastyle's Anda pattern (the same pattern I used for my Fraulein Maria dress), but shortened it to the "add length here" line and put in an elastic empire waist. I'm quite proud... I made the whole thing with french seams (using this tutorial) so the inside is clean and pretty. I still struggle a little bit with the bias tape (both making it and sewing it on), but it's getting a little bit better with each garment I make. The fabric is from the Real Martha. I believe she purchased it circa 1981. I'm not kidding. She also sent some bias tape made in 1978. It's older than me. Lincoln helped with the top... and by "helped" I mean that he pulled each of the pins out as I put them in. Tim and I were invited to a BBQ here in Jakarta this past weekend... the hosts made an awesome spread of great Aussie sausages, a whole baked red snapper with rosemary and some tasty steaks. Our contributions to the meal were of the side-dish and dessert variety: a grilled corn salad with feta, tomato, cilantro and a cumin-chili-lime dressing and fresh mint ice cream with chocolate chunks, both of which seemed to go over quite well with the crowd. The salad was really tasty and easy. Grill corn right on the cob until it's slightly charred, cut it off the cob and mix it with cherry tomato, chopped red onion and cilantro, and a lime vinaigrette flavored with chili powder and powdered cumin. The only changes I made to the recipe was to toast the spices for the dressing in a dry pan until fragrant before adding them... brings out the flavor. Also, I skipped adding the whole cumin seeds, as ours were a little "off." The mint ice cream was a big hit... while it wasn't florescent green like the stuff you get at the store, but it was better since it was full of natural mint flavor from steeping a bundle of fresh mint leaves in the cream before making the custard. Awesome. 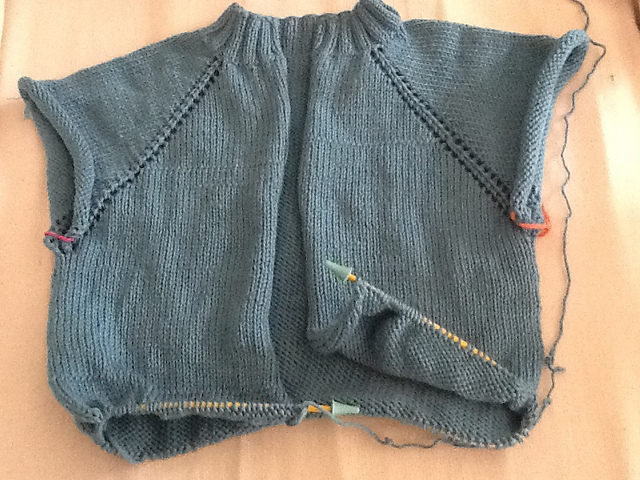 A couple of months ago I saw that the Lion Brand Yarn blog was hosting a knit-along for a top-down raglan cardigan that was already queued up in my list of to-makes, so I decided to join in. While I didn't exactly keep up with the knit-along or really customize the pattern in any way, I found it helpful to turn to the blog entries for guidance as I got to each turning point in the pattern. The top-down raglan approach is similar to that used for the baby cardigans I have been crocheting- you start with the collar, increase the number of stitches each row at 4 strategic spots around the shoulders/armpits (creating that line of lace), then pinch the armpits together and keep knitting down the bodice until you get the length you want. I ended up frogging (apparently knit-speak for unraveling) a crochet project I had been working on before, a tank top, after realizing it was somewhat ridiculous and I would never wear it (it helped that Colleen made fun of it when I mentioned it over Skype last fall). I used the yarn from that project (which I had purchased with a Groupon at DC's Looped Yarn Works), Berroco Comfort, for my raglan cardigan instead. I'm pretty happy with how my first adult-sized cardigan turned out! There are some twisted stitches here and there (I'm not so good at fixing mistakes, so I just try really hard not to make them in the first place), and my seaming is horrendous (but there's not much of it and it's under the arm for the most part) but it doesn't bother me enough to try to fix them. I would definitely consider making this again... as the knit-along demonstrated, the cardigan is infinitely customizable. I think it might be nice in a finer yarn, too, if you could get the right gauge... the worsted weight yarns is a little heavy for Jakarta even though the sweater itself is short-sleeved. We borrowed Mr. Ben's oven this weekend and baked up a storm of cookies... soft peanut butter cookies with peanut M&Ms. Pretty good! Be sure not to let the cookies overbake; take them out of the oven when they look just not quite done and you'll end up with soft and chewy instead of hard and crumbly. This recipe for cilantro-lime chicken pineapple skewers in last week's Washington Post Food Section caught my eye, and conveniently, I happened to have all of the ingredients on hand. Tim and I have been trying to take better advantage of all of the tasty tropical fruit here in Jakarta, and so we had purchased some mangosteens, pineapple and bananas and were able to use about half the pineapple for this recipe and still have half left over for snacking. Super easy and quite a tasty recipe... grilled pineapple is so good. I used bird's eye chilis instead of the serranos called for, and it was a little spicy. "A little too spicy" seems to be a running theme here, eh? Served with couscous cooked with garlic, green onion, a little butter and chicken stock. Tim and I tried another recipe from my Lobong culinary experience in Ubud, Bali since many of the ingredients overlapped with the chicken satay and peanut sauce... tonight's recipe was a pan seared tuna steak on top of a spicy, fragrant long bean and cabbage salad. And by "spicy," I really mean, "burned our faces off." Oops. Despite the excessively pedas salad, this dish was still good. Perhaps next time I would use fewer chilis. Far fewer. The recipe seems to be Chef Dewa's riff on the traditional Balinese dish, ikan bakar sambal matah, which is grilled fish with a raw chili sambal. He put the sambal and fish on some veggies and made it into a healthy and fresh tasting salad. 1. Toss all ingredients except tuna together in a salad bowl. 2. Lightly salt and pepper tuna steak, then sear both sides briefly in vegetable oil over medium-high heat. 3. Either top the salad with the tuna, or break the tuna up and gently toss it with the salad. 4. Enjoy and cross your fingers that you don't blow up from the heat of the chilis.